Summer is over and Nice Price or Crack Pipe is putting away its white shoes for the year. Getting back to work, we're going see who loves the ‘80s, and more importantly, a Diesel Chevette. Having their clock rung a few times in the ‘70s for a not particularly fuel-efficient fleet, GM looked to their foreign affiliates - who had already discovered the joys of high gas prices, and developed a number of small, economical diesel engines as a result. Turning to the east, they leveraged their partial ownership in Isuzu to source 1.6 litre oil burners, which were already rattling under the hoods of the abominable Opel by Isuzu cars sold by Buick. Those cars were dervations of the global T-car platform, bringing low-cost and underwhelming small cars to the world's people. 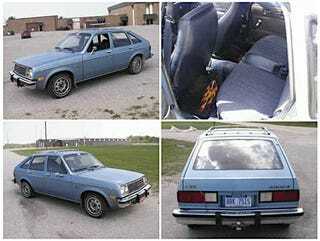 Another T-car, and the first sold in the U.S., is represented by today's candidate- a 1982 Chevette Diesel. Presented in middle-America blue, and described in Craigslist-appropriate all-caps, this 5-speed four-door offers a unique look at an era of uncomplicated small cars. Featuring rear wheel drive and a bullet-proof (make sure to check that timing belt!) iron block four, the chevette offers engine accessibility unheard of in a modern compact. Forty MPG would not be out of the question, as would interminable freeway on-ramp runs. This might be the perfect first car for that twitchy teen on your list. There is nothing better than a glacially slow and sexless four door to keep a new driver self possessed of their own immortality grounded in reality, despite the seller's claim that car is fun to drive. Only ninety one thousand on the odo means there's still life left in this last of a dying breed, although that might be because it spent so many years hiding out behind a motorhome. So, does a $2,200 diesel chevette make your passions burn with the heat of a million glow plugs? Or is that just throwing fuel on the fire of mediocrity? Northern Michigan Craigslist or, go here if the ad disappears. Thanks to tempesjo, who tipped another Diesel Chevette, which was already gone, so he gets credit for this one.